Since January 2017, visitors to Napa have been treated to vivid displays of contemporary art in an unexpected setting. A previously nondescript two-mile corridor that runs through a semi-industrial neighborhood in Napa has become a vibrant arts district, thanks to the visionary leadership of the Napa Valley Vine Trail, the Napa Valley Wine Train, and members of the community. The corridor can be seen from the ever-popular Wine Train as well as the Vine Trail, a 47-mile-long hiking and biking route that will eventually run through Wine Country from Vallejo to Calistoga. Ultimately, McMinn says, this passage will also function as a fully developed arts district, drawing visitors interested in the aesthetic experience it offers. The first work RAD introduced was an evocative 210-foot mural called Knocking on Heaven’s Door by Polish artists Bezt (part of the Etam Cru duo) and Natalia Rak, which depicts a woman reaching for a luminous butterfly. That was followed by a colorful graphic mural called Chromodynamica Napa by Argentinian-Spanish graffiti artist Felipe Pantone. In short order, RAD and the city added eight more murals to their roster of works. 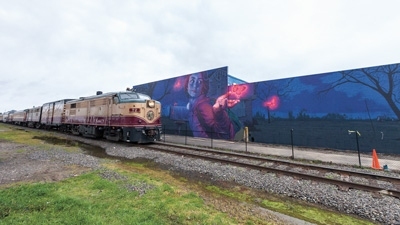 In addition, RAD has commissioned 12 original pieces to “wrap” the Wine Train’s signal boxes along the corridor; plans are also in the works to invest in sculpture, landscaping, and gateway features. As of this summer, some 20 artworks are on view, and RAD’s ultimate goal is to feature some 100 installations over the next decade.